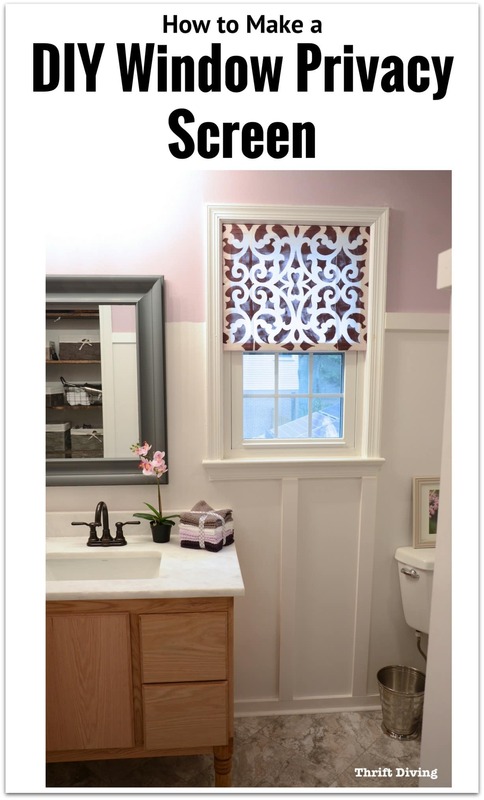 Making a DIY privacy window screen is the perfect DIY window treatment. If you can’t hang curtains, have an odd-shaped window, or would love to remove the privacy screen to let in light during the day but easily put it back in place at night, then a privacy window screen that you can make yourself is the way to go! 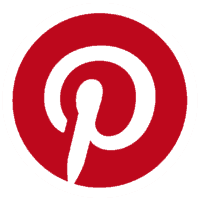 Click here to SAVE this privacy window screen on Pinterest. 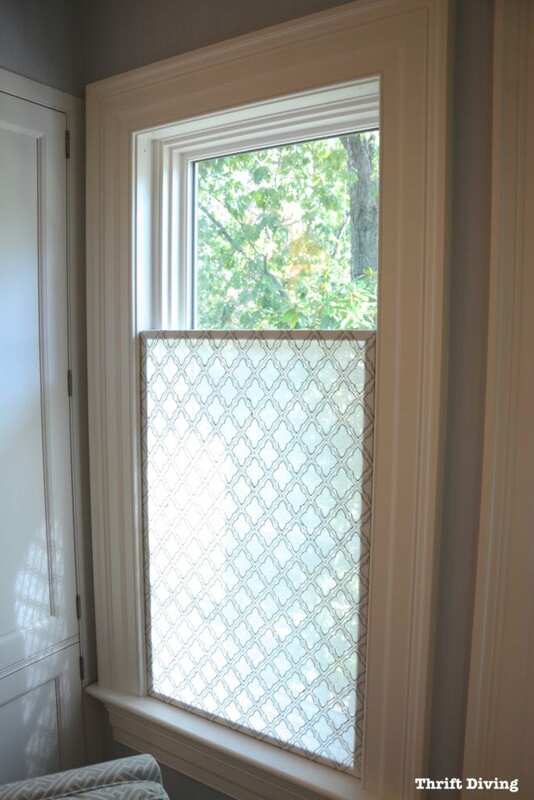 Do you remember my excitement when I saw this privacy window screen during a home tour? I had gone to the DC Design House home tour, and I wrote a post called 10 Ways to Decorate Your House Like the Pros. 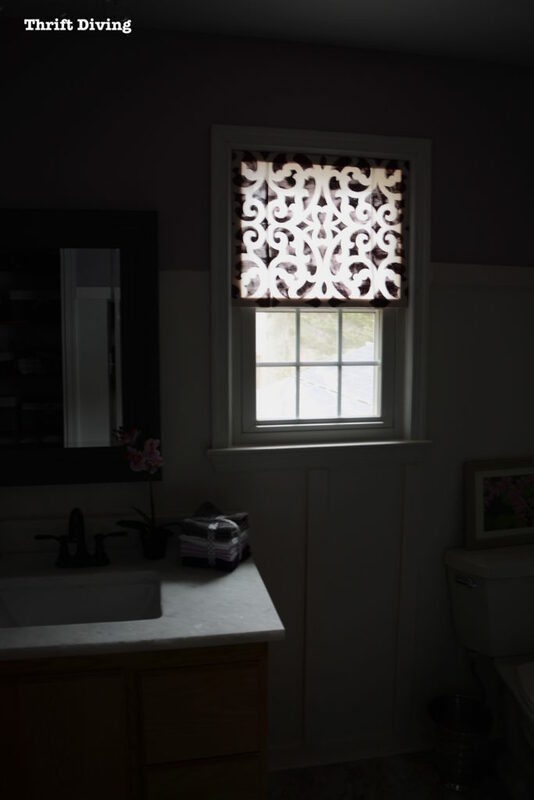 I was blown away by this idea alternative window treatment idea of using a removable privacy window screen, so I included it on my list as #8! Usually, I’m obsessed with curtains because I love sunlight and the way curtains on a bare window can expose the whole view. But the idea of a window privacy screen that can easily be removed or moved up and down was so cool that I decided one day I’d make my own for my master bathroom makeover! 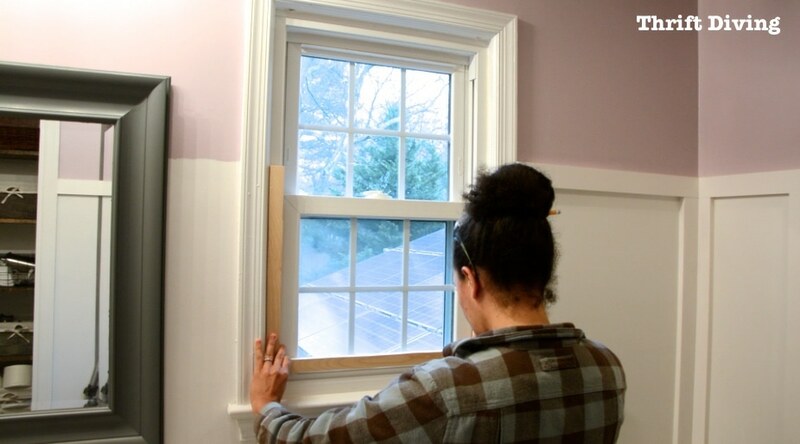 Below I share with you the tutorial, along with some “lessons learned” when you’re ready to make your own DIY window privacy screen. This is a simple project, but there are a few things you’ll need. Strips of plywood or inexpensive pine. Jigsaw or some other tool to cut your wood to size. 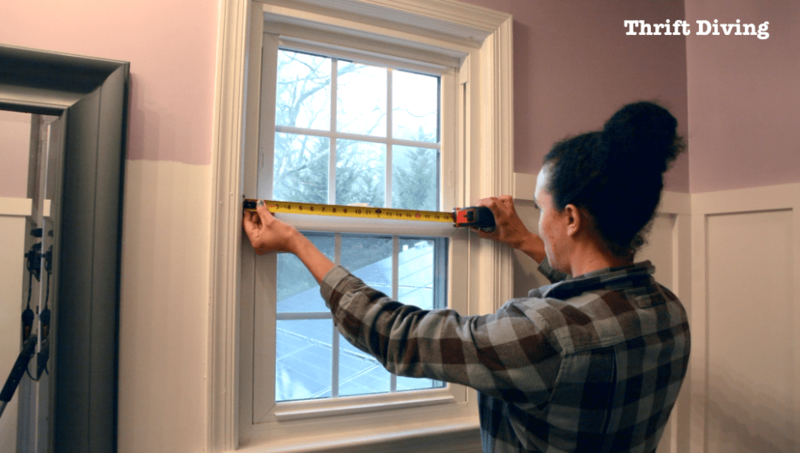 The first thing you have to do to make a privacy window screen is to measure your window in 2 places: the width of your window and how high you want your DIY privacy window panel to be. I wanted mine a little more than half the window, so I measured in these areas: across and down. Here’s what you have to remember, though. Whatever height and width you want your window privacy screen to be, you’ll need to account for the thickness of the wood. If you’d like the total height to be 20 inches high, then the side pieces, the top, and the bottom must total 20 inches. For example, as seen in the picture below, if my top piece and bottom piece of wood are 1.25 inch each, my side pieces must be 17.5 inches. Add it all up and you get 20 inches. (1.25 + 1.25 + 17.50 = 20 inches total in height). 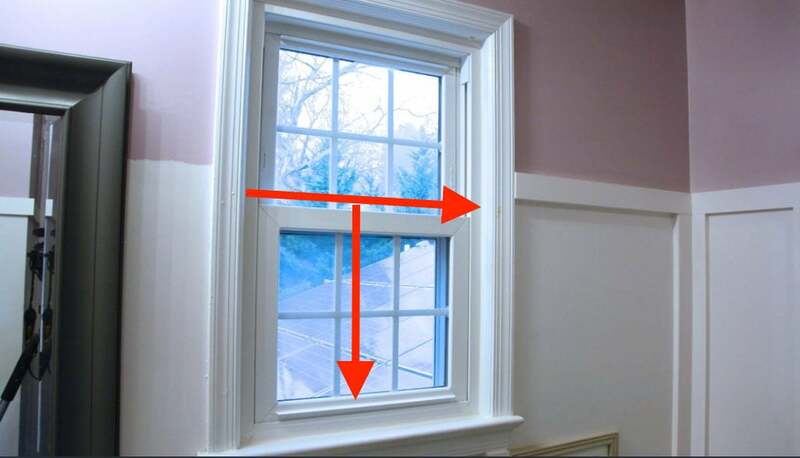 TIP: Click here to watch this YouTube video for tips on how to take measurements inside of windows and other awkward spaces! This is what will make up the DIY window privacy screen frame: just 4 pieces of skinny wood that you’ll glue and/or nail together. You don’t have to cut yours out like I did with a jigsaw. I only used this 3/4″ plywood because it’s what I had on hand. 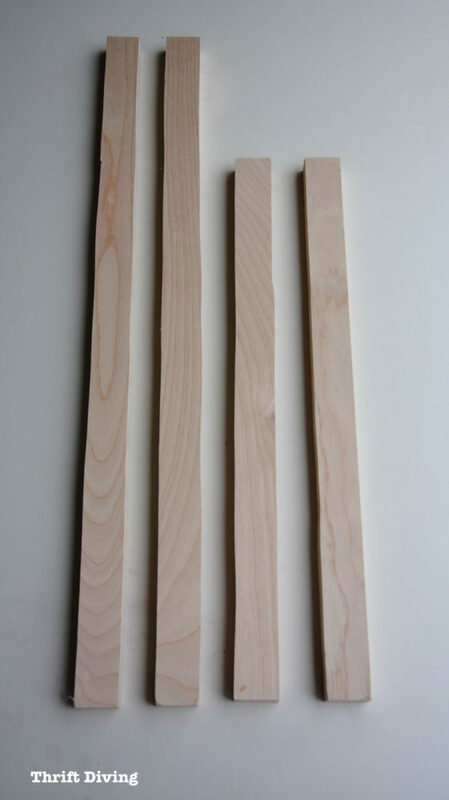 If you go to your local home improvement store, they sell skinny pieces of wood in 1 inch x 2 inch sizes like this that would work just as well. And if you don’t have a power tool, don’t worry! 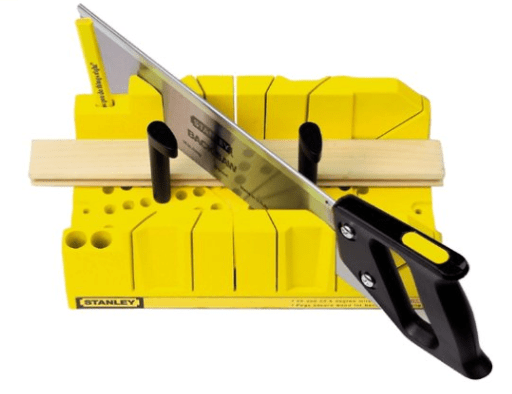 You can use a handsaw, like this miter box, which makes cutting small pieces of wood super easy. Just set your wood on it and cut! I think they range from $8 – $16, which is super affordable. 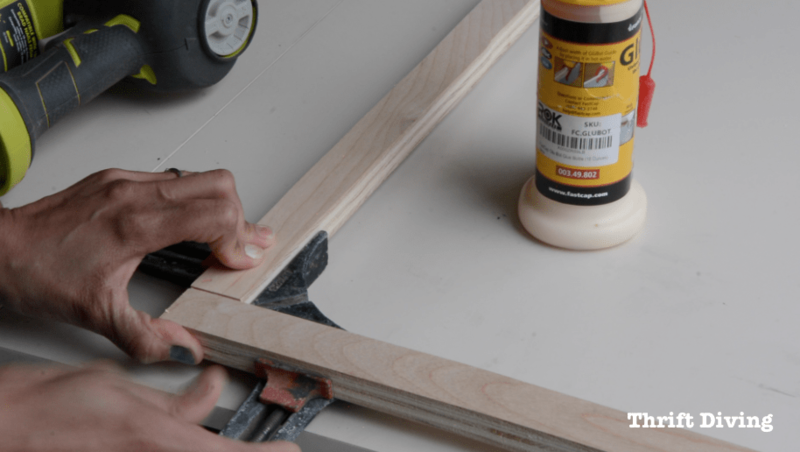 Read: How to make picture frames without power tools (only using a miter box). 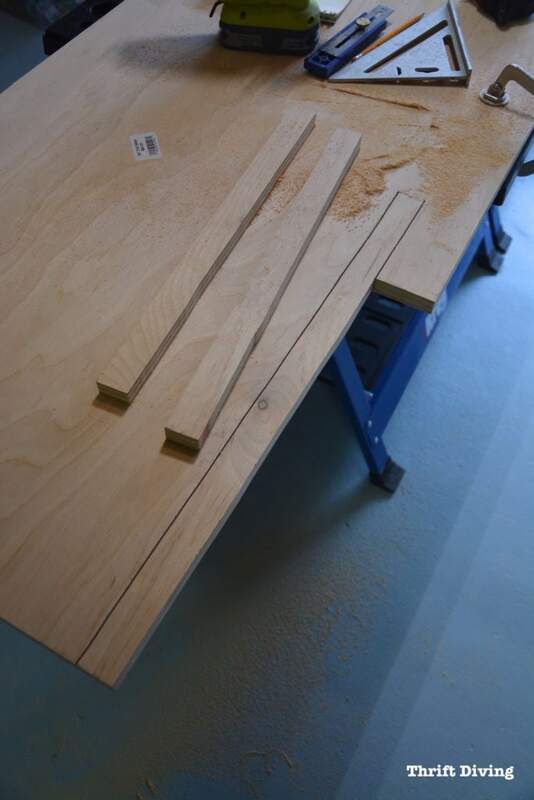 Before you glue or nail them together, make sure you test fit them. You’ll want your pieces to fit snuggly, but not so snug that you won’t be able to adjust the privacy screen in the window. When I test fitted my pieces, I realized that the bottom and middle of the window were larger than the top part of the window. It was going to be much too tight! Now you just have to glue or nail the pieces of the frame together. It will make a nice square or rectangle, depending on the size you make. 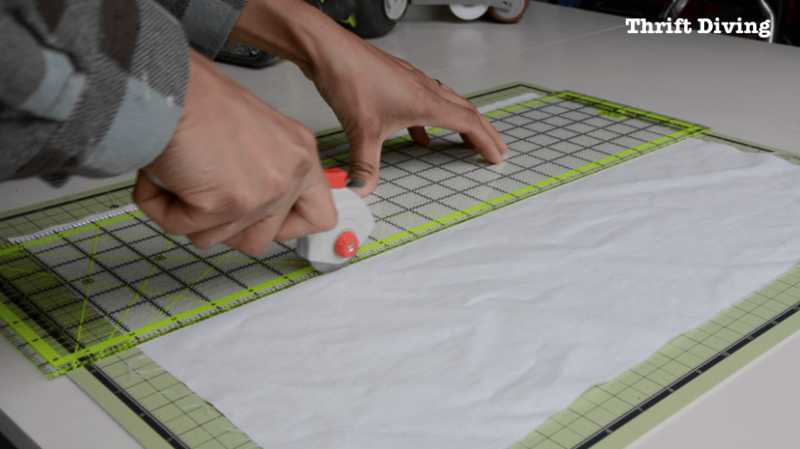 If you’re using sheer fabric that won’t need cutting out, then you can skip this step. 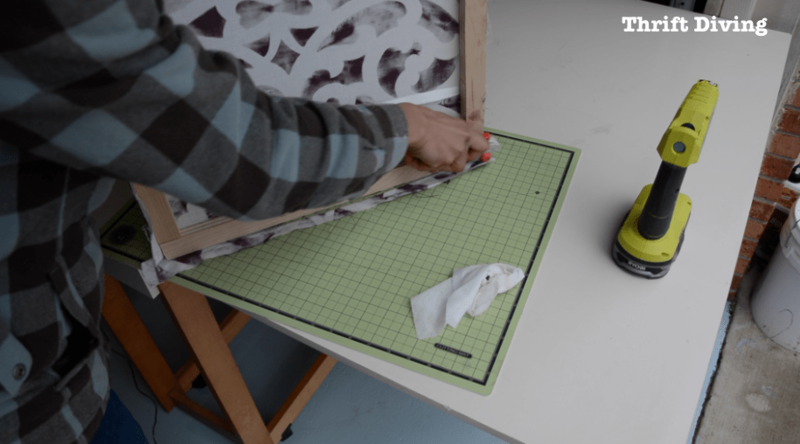 For me, I had to not only cut my fabric, but I had to join it together with Heat ‘n Bond fusible iron-on tape so that it created a larger piece to fit over the wood privacy screen frame. 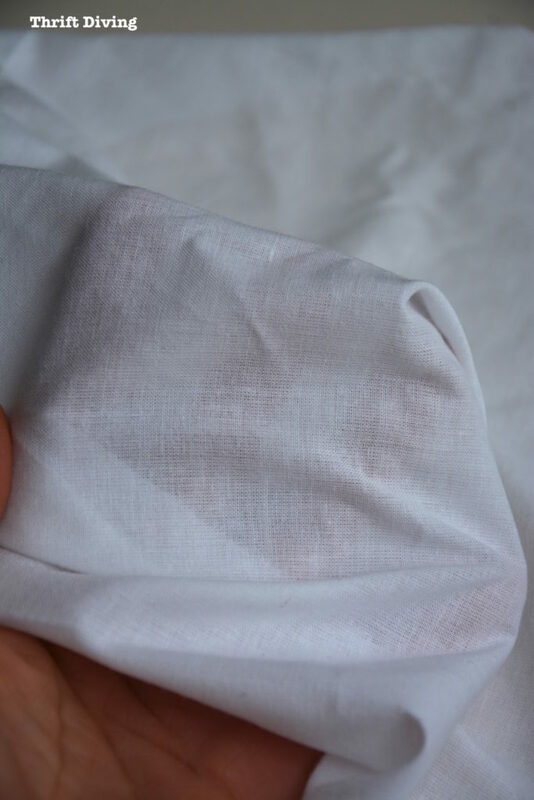 Be sure to use thin lining material (or thin muslin) so that you don’t block the sunlight coming through your windows. I already had this fabric on hand, but there wasn’t very much. TIP: A reader had a great idea: You can also use a thin white lining material on the back if you’re worried about colorful fabric showing through to the exterior of your home. I have a larger cutting mat, but because it’s so big, I never pull it out. It’s too cumbersome! 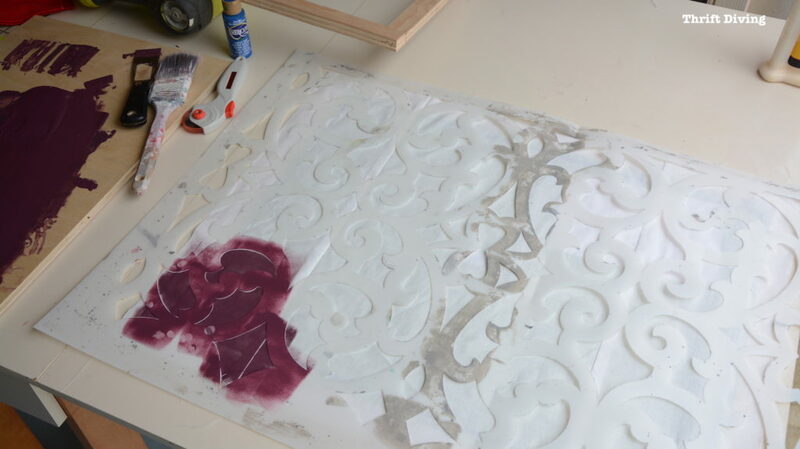 Use a small self-sealing cutting mat and a rotary cutter which I find it easiest for cutting. 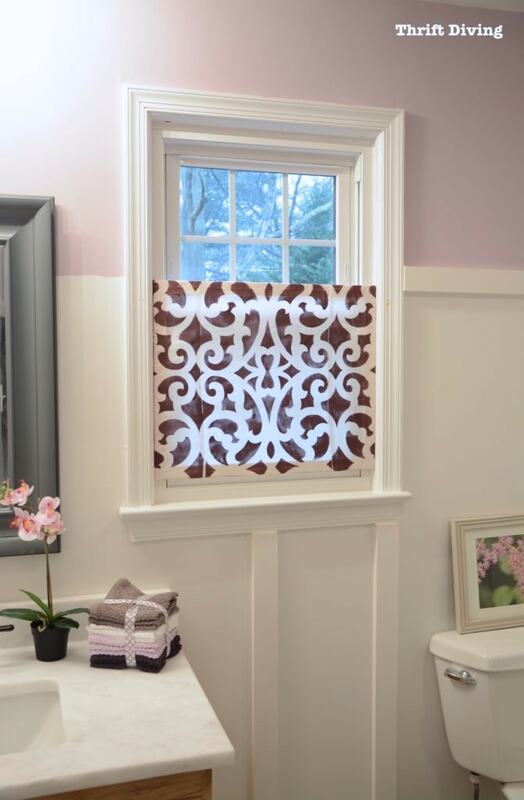 I decided to use one of my favorite trellis stencils for the window privacy screen. But first, I mixed my own paint to get the shade of purple that would compliment the lavender in my bathroom. 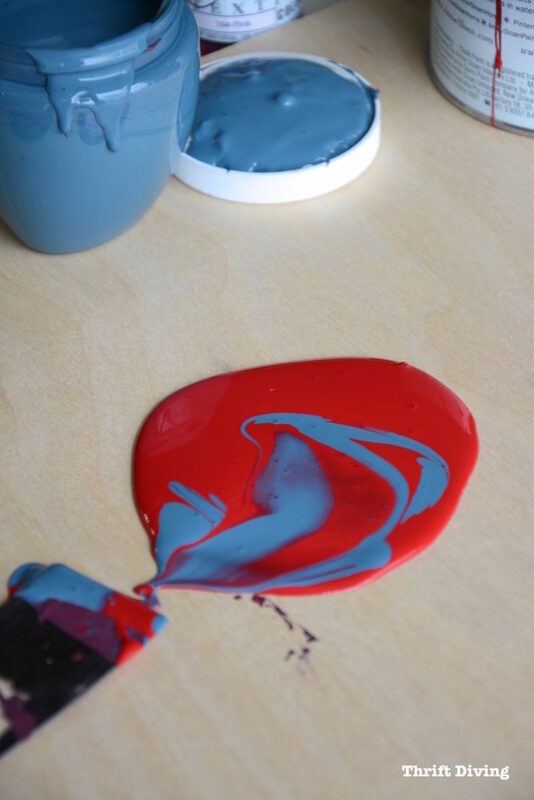 I had some chalked paint on hand and just mixed red and blue. I thought I was going to use my roller stamp, but I didn’t like the outcome when I did a test fabric. So I went with my tried and trusted favorite trellis stencil. You can use hot glue like I did or spray adhesive for fabric. 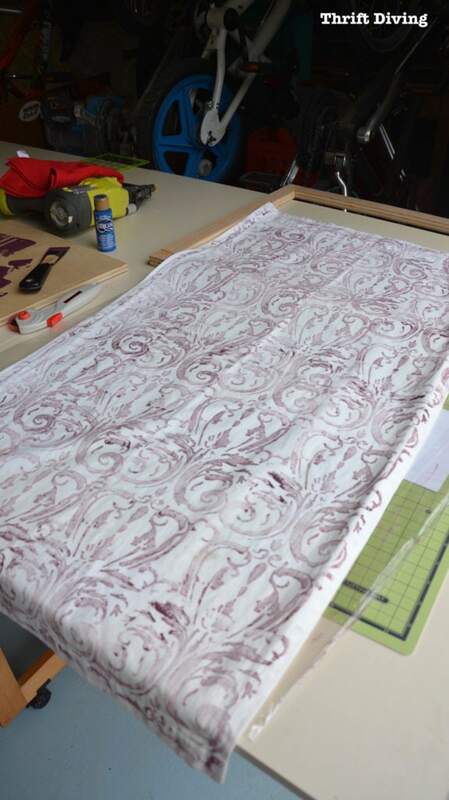 Just make sure the fabric is evenly spaced so that you’ve got enough fabric to glue on each side. I would recommend you have a large piece of fabric that will allow you to wrap it around to the back side. I didn’t have enough to do that, though. You can use the rotary cutter to easily trim off the excess if you’d rather it be flush with the edge of the wood frame. This is the true test! Did you take the right measurements? 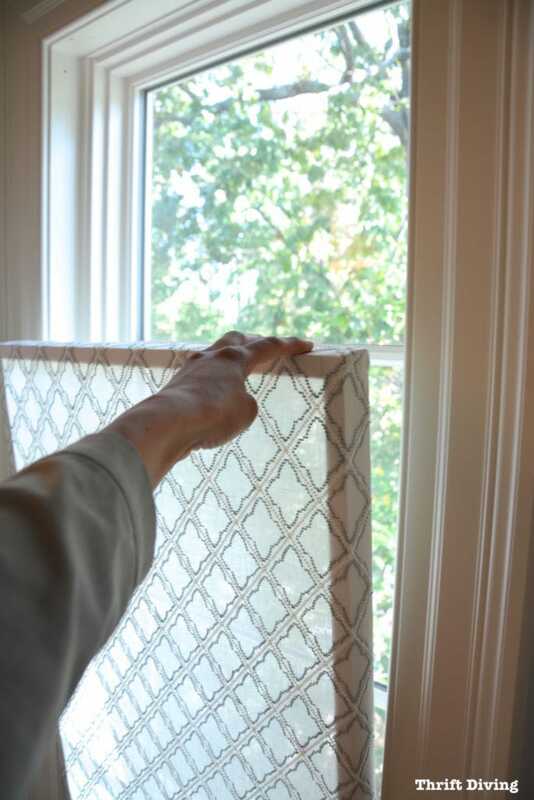 Is your fabric too bulky and now the perfectly measured DIY window privacy screen won’t fit? Because my window is more narrow at the top, it was a tight squeeze for it to get in, so I made some adjustments, including sanding down the side a bit. But since it was just hot glued on, it wasn’t a problem to adjust it. Let’s take another look at the BEFORE and AFTER. Since it’s adjustable, you can slide it up or down when you need or don’t need privacy! Because my window is a little snug at the top, it takes a little bit more effort for me, but I’ll make those adjustments so it slides more easily. Love that! See how you can move it up and down? 🙂 Keep it up during the day to see outside. Put it down at night for privacy. Love it! Love this project?? Click here to SAVE it! I loved how it looked when I turned off the bathroom light, too! There were definitely some things I would do differently next time. Don’t stencil the edges of the window privacy screen. 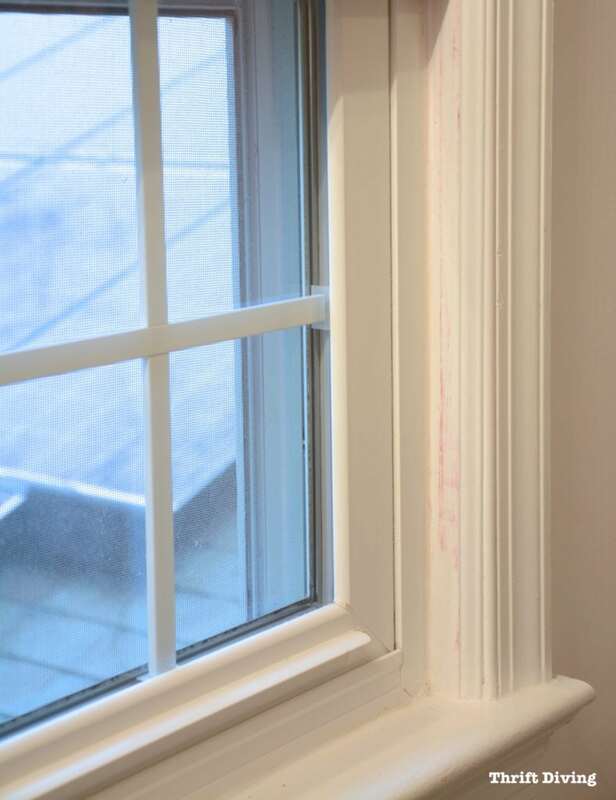 Because it’s such a tight fit (and because the paint hadn’t totally dried by the time I tried to fit it in), the paint started rubbing off on the window sill. 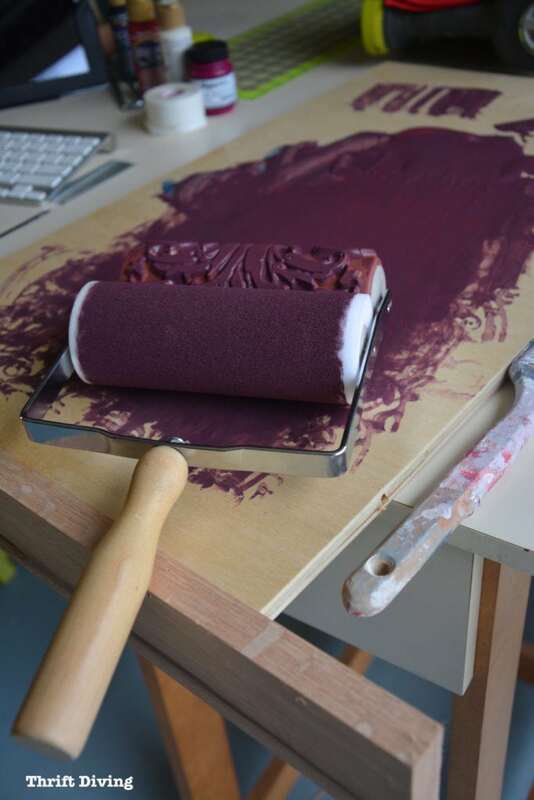 Either wait until your stenciled fabric is totally dry before fitting it, or leave the edges un-stenciled. Use one whole piece of fabric. Of course, I used what I had and used fusible iron-on tape to make a large piece. But I think it looks better if you use a whole piece of fabric. 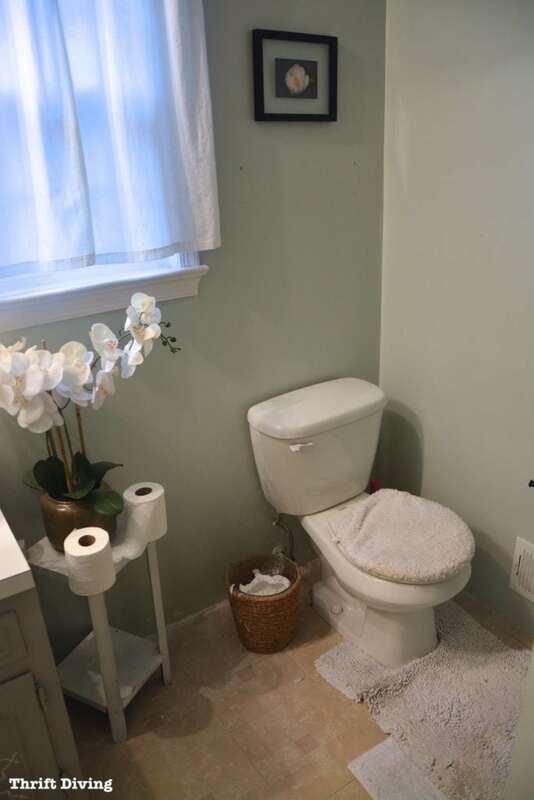 My bathroom makeover turned out great! I build my own 60″ DIY bathroom vanity from scratch for this master bathroom makeover. I also painted my shower and got rid of this ugly 70’s turquoise shower! You can see the entire video tutorial on how I refinished my shower using a tub refinishing kit. If you want to see everything that’s been done in the bathroom to get ideas and inspiration, check out the posts below! 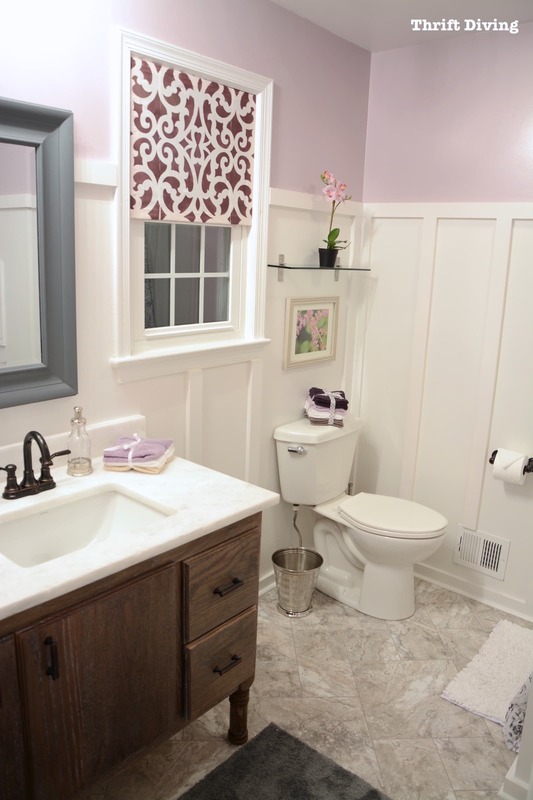 Read the Rest of this Bathroom Makeover Series! 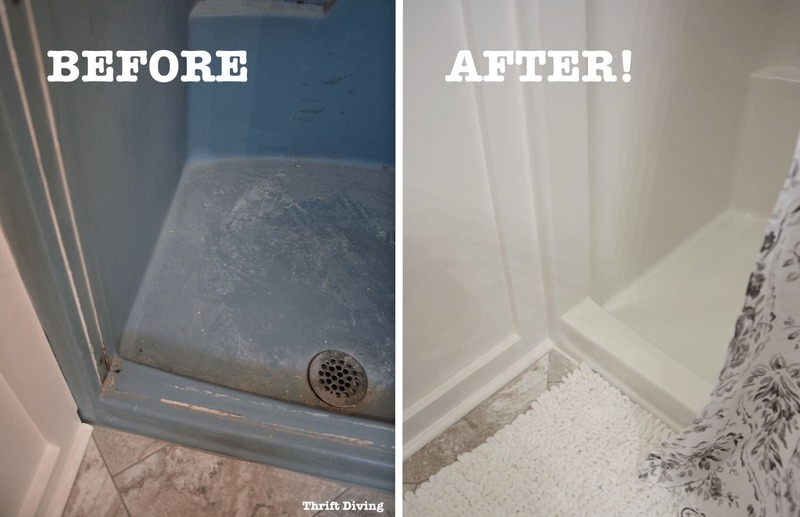 BEFORE & AFTER: The Final Master Bathroom Makeover Reveal! So what do you think? Do you think you could make this privacy window screen? I love this. I have an octagon window in our guest room that i could never think of what kind of curtain to put up. I didn’t want a square cutain on it and the sun shines on that window i tbe morning, very bright. I am going to make this window cover, but use darker material, some kind of pattern, so when it is off the wondow it can hang beside as a art piece, then slip it into window at night for shade. Love it. Thanks for the great idea. What a great idea. I was in the custom window treatment business, having made tons of custom inside mounted Roman shades .. 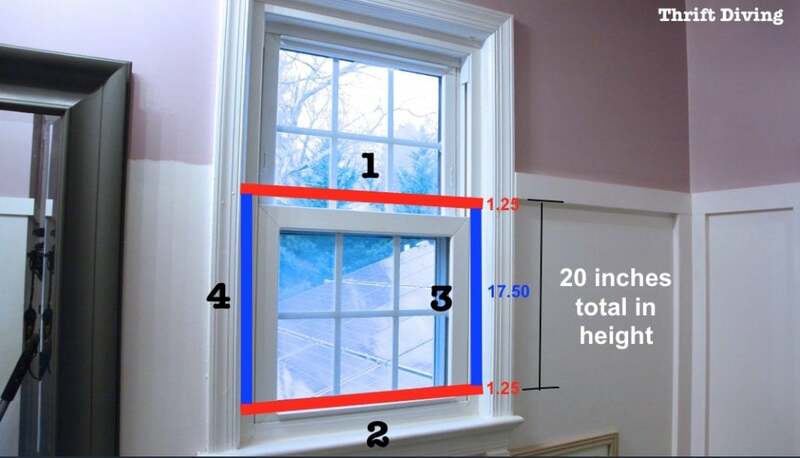 I would have measured that totally differently … I would have measured the width of the window at the top, middle and bottom and used the smallest measurement. There would be no sticking. To mount it on the wind .. Velcro! 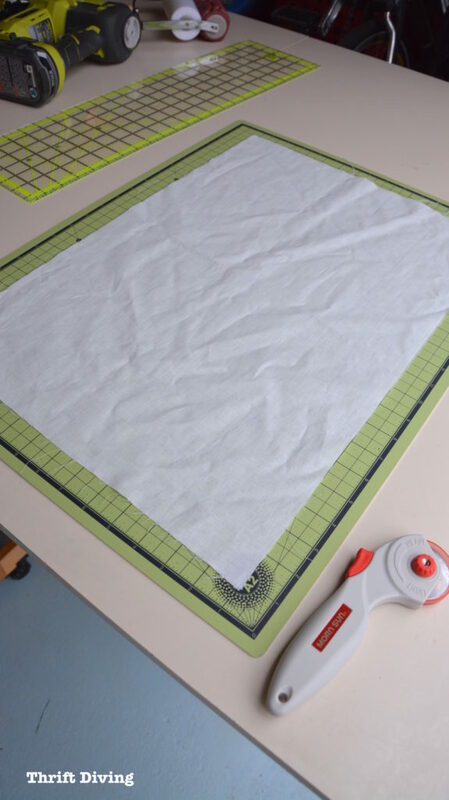 Instead of hot gluing, staple the fabric. Why did you piece fabric together? You could have gotten a piece big enough to fit and probably cost what you paid the the iron on tape. This is adorable & what a great DIY for the home. I will be featuring this in my 16 Stylish DIY Home Decor Ideas at Merry Monday on Sunday at 6 pm pst. Hope to see you at the party! I love it. Don’t think I could stencil that evenly. What keeps it in the window ? Did I miss a step ? The way that the window screen stays in place is because it’s the width of the window so it wedges itself in the window. No hardware needed! 🙂 You just have to make it slightly smaller than the width of the window, and of course, you’ll need a window that has enough depth to wedge it in there. But most windows have depth to them, so it should work on any type of window! 🙂 Good luck!